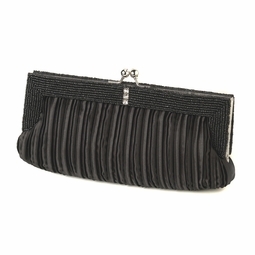 Description: This beautiful black satin clutch with decorative beading on the outer edge of pleating is absolutely stunning. Embellished with three clear sparkling rhinestones on either side of the purse and on the kiss closure this accessory has fabulous features. Inside side pocket and chain that can be used with or without to make into the perfect over the shoulder bag!